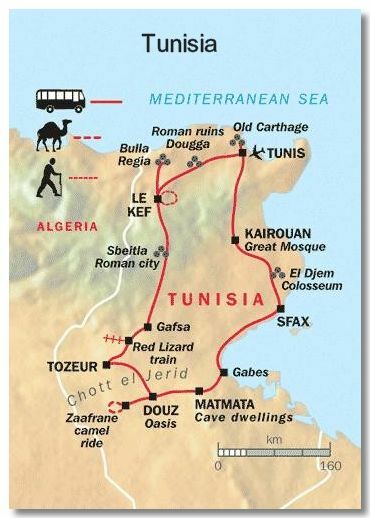 In September Ann & I went on an escorted group tour to Tunisia using Explore! 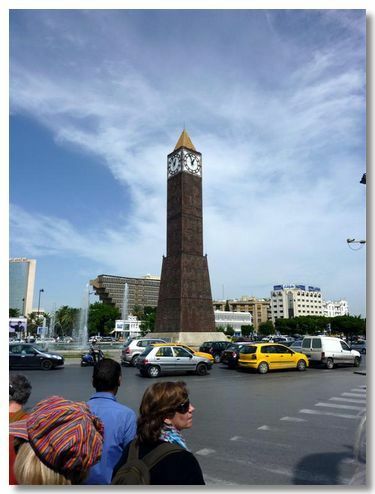 Starting and ending in Tunis we completed a clockwise tour of Tunisia, see map, left. The holiday was in two parts; visiting various different areas of the country (Medinas, Sahara, Troglodyte caves, etc.) 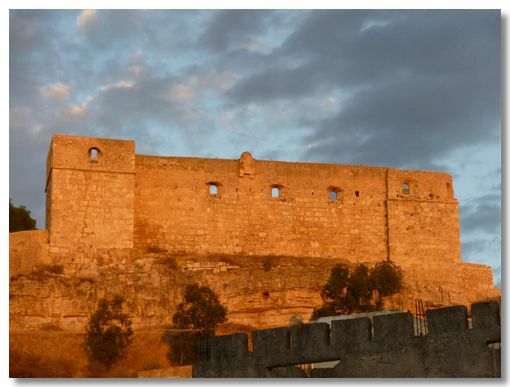 as well as several key ancient sites, such as Carthage and El Jem. Three months after visiting what we thought a peaceful stable country, a popular uprising ousted the president. Rather than showing the photos in strict chronological sequence, I think it is easier to show them by topic - hope you agree. 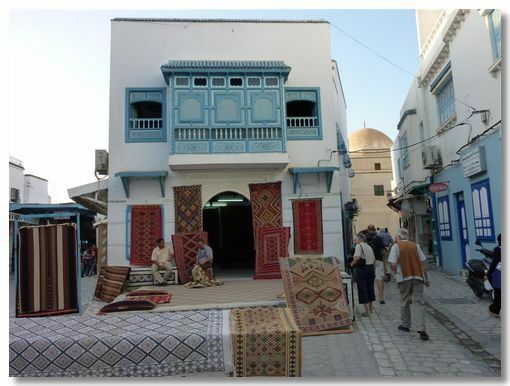 Tunis is an ex-colonial, French city, built around the old Medina. Some of the Art Nouveau buildings are very charming. However, the upturned pyramid behind the clock tower is a hideous 1970's hotel, whose only claim to fame is that it mimics the design of the "sandcrawler" in the movie Star Wars. 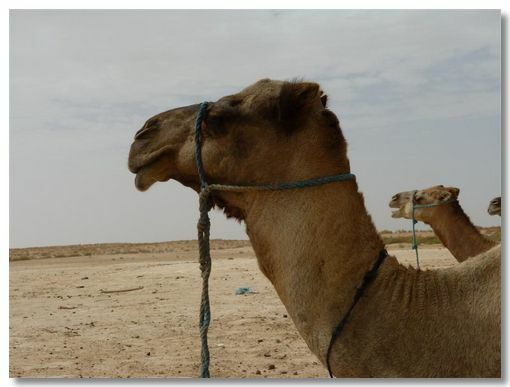 See the Desert Excursions link in my Travelling page below for more Star Wars memorabilia. 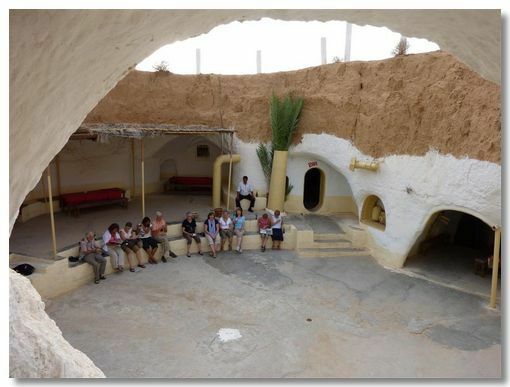 Yes there are troglodytes in Tunisia - and not just in the remnants of old movie locations. We had an unusual night's sleep in a traditional underground cave in Matmata. 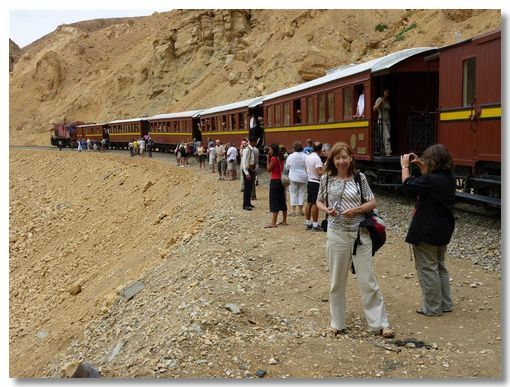 A train ride through the Seldja Gorges in a revamped 19th century train made for a different way to see some of Tunisia. I love Kasbahs! But we only saw the one when we stayed in the mountain village of El Kef (or Le Kef in the French guide books). The most charming parts of the cities we visited. Less hassle in the Souks than either Egypt or Morocco! Usually very serene and spiritual - even with a load of noisy tourists taking photos. Half the holiday was visiting classical sites. There is hardly anything to see of the older Punic Carthage as the Romans did a highly successful demolition job in 146BC. 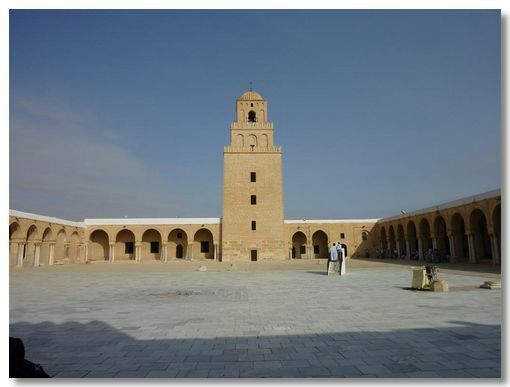 The Arabs some 8 centuries later repeated the process yet again with many Roman pillars now propping up various mosques. El Jem is the most spectacular Roman amphitheatre after Rome's Colosseum. 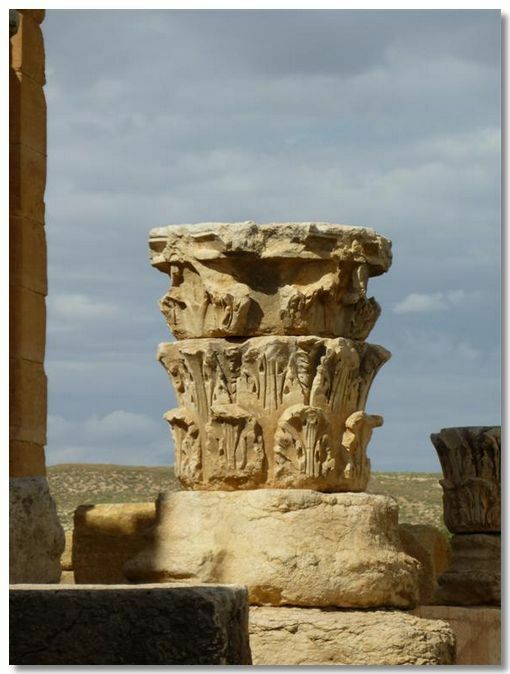 The remains of the provincial Roman towns of Sbeitla, Bulla Regia and Dougga have little historical interest. Nevertheless the remains were appealing to wander round.